January 25, 2012, 12:26 AM · I have to confess that for the first part of Mahler's Symphony No. 2, ("Resurrection") at Disney Hall Sunday night, I was counting people on stage. That's because the Simón Bolívar Symphony Orchestra of Venezuela is one big group! The Venezuelan orchestra came to Los Angeles to share the privilege -- or burden -- or gargantuan task -- of playing all nine completed Mahler Symphonies over the next few weeks for The Mahler Project with conductor Gustavo Dudamel. 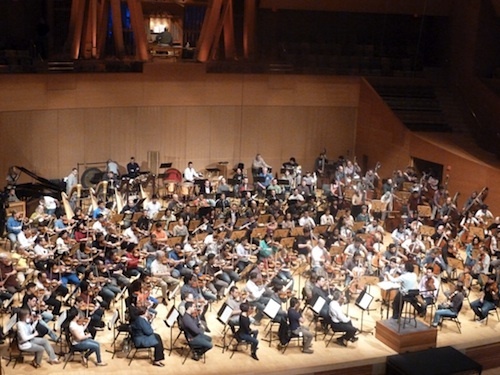 While LA Phil has performed or will perform symphonies 1, 4, 6, 8, 9 (and the unfinished 10), The Simón Bolívar orchestra will play 2, 3, 5, 7 and share the stage with LA Phil for 8 -- the "Symphony of 1,000," in which literally 1,000 musicians will share the stage. The Simón Bolívar Symphony Orchestra is the premiere orchestra of El Sistema, the huge, government-funded music program in Venezuela that trained LA Phil conductor Gustavo Dudamel and has been making waves in the music-education community all over the world in recent years. They may not have had their full complement onstage for Symphony No. 2, but it was close. The program listed 175 musicians in the orchestra, and the numbers seemed to correspond; for example, the program listed 25 first violins, and indeed, on Sunday there were 25 first violins. Of the 175-some musicians on stage, 24 were women. Another friend of mine must have felt the urge to count as well, because she noted that "22 of the women were wearing sleeveless dresses!" Well, they looked nice, and remember, this is a youth orchestra. The musicians are all age 18 to 28. With so American orchestras coping with budget cuts by cutting musicians from orchestras, here's a reminder of why it pays to think big: there's power in numbers. That power was on display all night: from the first vigorous tremolo in the strings that begins the symphony, to the presence those numbers brought to the quietest pianissimo. Joining the orchestra were 100 members of the Los Angeles Master Chorale, as well as soprano Miah Persson and mezzo-soprano Christianne Stotijn. With so many on stage, there were still standouts in this crowd; most notably for me, the beautiful, flowing flute solos in the first and fourth movements played by Katherine Rivas, and also excellent piccolo solos (I could not locate the name of the piccolo player in the program). Mahler's second symphony explores death -- for Mahler, the death of the hero he created in his first symphony; and then it explores redemption and the resurrection of the spirit. The first movement is full of note patterns that creep downward, as well as a fugue whose subject seems almost like a Dies Irae, the well-known requiem chant, though not quite. The short col legno section gave it menacing punch (think 50 violinists clap-clapping with the wood of their bows, instead of 30). All marches marched downward, and the movement ended in an emphatic chromatic scale that tumbled down into three very final-sounding pizzicati: Pluck. Pluck. Pluck. Mahler apparently instructed that the orchestra observe a full five-minute silence after the first movement, as the composer wrote it in isolation from the rest of the symphony. For this performance, the orchestra tuned in between, which seemed both practical and sufficiently observant of the request. The second movement is polite and careful: "May I have this dance?" Here is where so many strings made for such a full and rich piano -- quiet, but with presence. The dance had its contrast with a more complex section in triplets -- something a little more mathematical-sounding. The dance, a ländler, kept coming back, very restrained, like a quiet dance in the night. Its last iteration, a gentle dance in pizzicato, was accompanied for me by my neighbor's cell phone. NO! Yes, it happened. Nothing like the scandal in New York, but it certainly broke my reverie! The third movement sounded like a careening ride through a fun house -- a dark fun house full of spooky-weird images. Toward the end was a giant, 175-member full-orchestra blast, which came to its height and then floated down, suspended as though a parachute had opened and was gently carrying the musical line downward. Mezzo-soprano Christianne Stotijn began the fourth movement singing alone -- how the small moments contrasted with the giant ones! Her voice ascended beautifully. Midway through the last movement came my favorite spot, when 200 voices in the LA Master Chorale entered, full and low, almost unexpected, singing a-cappella, "Rise again, yes, rise again, will you my dust, after a brief rest..." Miah Persson's soprano pierces through all-- everything soars. It's one of the most beautiful moments in all of Mahler. The entire last movement is all uplift: notes ascend, the choir sings, "rise again, yes rise again ...prepare yourself to live." Even the entrance of the organist had a feeling of ascension at Disney Hall, taking his seat an alcove above both the choir and orchestra. The music grows and ascends, the pipes sound, the violinists reach around, nearly to the end of their fingerboards to play ever higher and higher. I wasn't the only one lifted. The audience stood, clapping for at least 10 minutes, continuing after the house lights came on, continuing even as the musicians finally walked off the stage.